A close compatriot of President Bush squats in a scandal so malodorous it led news shows from coast to coast. It's a scandal that some say is too hot for Bush to comment on. But there was the President, speaking without a stammer or stutter on this issue of pressing national concern. There was only one curious twist. The scandalized bosom buddy was not the bosomy Karl Rove, but Baltimore Orioles first baseman Rafael Palmeiro. Yes, in an era of war and economic crisis, Bush took time to rush to the defense of a four-time All-Star who has become the highest profile casualty of Major League Baseball's steroid testing program. Bush called Palmeiro a "friend" and said, "He's testified in public [to being clean], and I believe him.... Still do." Presidential lickspittle Scott McClellan also made clear at a White House press briefing that Palmeiro has the full support of the Oval Office. players were on the juice. It no doubt will puzzle future generations (or present ones, for that matter) why the President felt compelled to comment on what a 40-year-old ballplayer may or may not have ingested. But the reasons are clear enough. This is a case of how the Bush administration's Politics of Distraction have turned around to nip the President in the tush. It all began at the January 2003 State of the Union address when Bush inexplicably took time to talk tough on steroids. As New England Patriots quarterback Tom Brady grinned next to the First Lady, Bush put the plague of steroids on the front burner of the national consciousness. This was Politics of Distraction 101, a classic ploy to give the public something to chew over instead of those two pesky countries the US armed forces happened to be occupying. But a fly flew into the flaxseed oil when bankrupt former all-star Jose Canseco attempted to capitalize on steroid mania by releasing an inject-and-tell book called, appropriately enough, Juiced. In Juiced, Canseco names every buttock that cozied up to his all-star syringe. Two of those cheeks, Canseco revealed, belonged to Palmeiro. The repercussions were immediate. Palmeiro had always presented himself as a Holy Joe, a rock ribbed Republican, a podium thumper for the American Dream. Thanks to Canseco, Palmeiro found himself subpoenaed and forced to testify in front of congress last March. 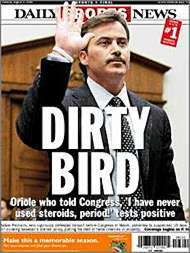 Grimacing with indignation, Palmeiro wagged his finger and said under oath," Let me start by telling you this: I have never used steroids. Period. I don't know how to say it any more clearly than that. Never." The performance was convincing. So convincing Palmeiro was even named to a Congressional committee that would work to "clean up the sport." Canseco was the liar. Palmeiro the hero dragged through the mud. Never mind that after Canseco joined the Texas Rangers Palmeiro's home run averages jumped from 19 per year to 37. Never mind because the steely-eyed Palmeiro made you believe that his anger was righteous. Now, in the wake of this latest test, he looks like the one thing worse than a liar: a sanctimonious liar. As Tom Boswell of the Washington Post wrote, "In this culture, heaven help you if, after playing that once-per-lifetime, I-swear-on-a-stack-of-Bibles card, you get caught." Palmeiro's state of disgrace also means that we are now treated to the sight of Canseco, last seen living with Omarosa and Bronson "Balki" Pinchot on VH1's "The Surreal Life," posturing like Abe Lincoln, parading around talk shows saying things like (and I love this quote) "Palmeiros test proves that almost everything in my book is true." If we are now to accept Canseco's book as holy writ, we should also remember that his Texas Rangers team had an owner named George W. Bush who Canseco describes as "most certainly knowing" that the players were on the juice. This went wildly underreported when the book was released, largely because Canseco's credibility was in constant question. Now that Canseco has morphed into Honest Abe, we should start asking whether Bush should receive the next congressional subpoena about steroids in sports. We should ask what Bush actually knows and when did he know it. We should press Palmeiro on what his friend in the owner's box, the former cheerleader from Yale, did and did not allow. We should take these Politics of Distraction, which Bush hoisted into our lives, and drop the whole stinking, steaming, anabolic load on his front door. Note: Dave Zirin's new book, "What's My Name Fool? Sports and Resistance in the United States," is now in stores. You can receive his column, Edge of Sports, every week by e-mailing edgeofsports- subscribe@zirin.com. Contact him at whatsmynamefool2005@yahoo.com.